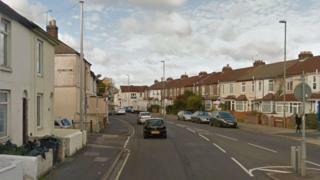 A man and a woman have been arrested on suspicion of murdering a three-week-old baby in Hampshire. The baby boy was taken from a property in Forton Road, Gosport to hospital on 21 March. He died seven days later. Police said the 23-year-old man and a 29-year-old woman arrested had been released from custody but remained under investigation. The force said they were previously arrested and bailed on suspicion of attempted murder. Police are awaiting the results of a post-mortem examination to determine the cause of the child's death.